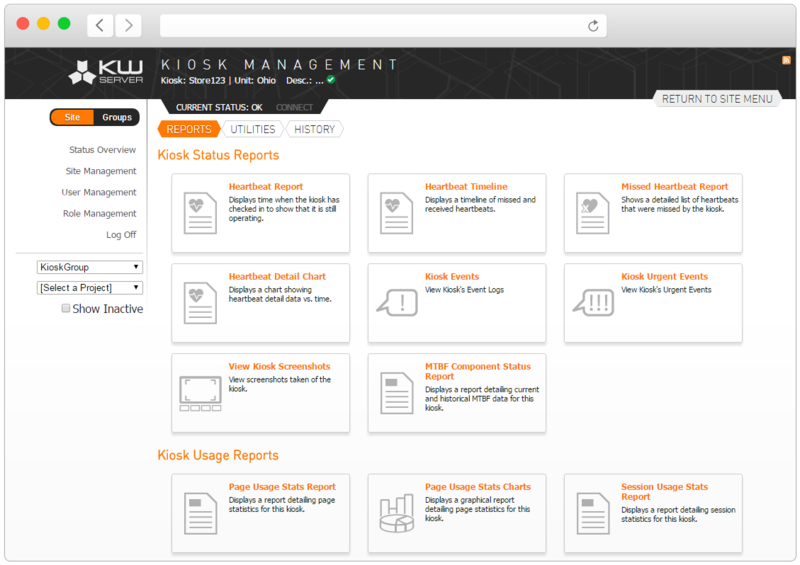 Our remote management tools make it easier to control, manage & monitor your kiosk deployment from anywhere. Kiosk Pro has partnered with KioWare, a well-known name in kiosk management, to create a full-featured remote kiosk management system for our Plus & Enterprise versions. Allow the app to check in with the server through a regular heartbeat, which sends device information like current connection status, battery life and available memory. See how often your kiosk is being used and where visitors are navigating in your content. Compare data across different kiosks. Be notified when your kiosk is not functioning properly or when specific events you choose occur (for example, if the paper is running low in the kiosk’s thermal printer). Remote Management Server subscription includes cloud hosting and updates. Access to this server is only available through our Plus and Enterprise versions. We're happy to set up a free trial of the server so you can see how it can simplify your kiosk deployment. Apply settings remotely using an .xml template with Basic. Change content files stored locally on the device using a .zip with Plus. Connect Plus to your Dropbox account. Upload your content to Dropbox and it will automatically download to your kiosk.